South Africa’s marine and coastal environment contributes significantly to the country’s economy in terms of employment, tourism and recreation. Direct benefits of coastal goods and services exceeded R168 million, with an additional R134 million of indirect benefits. The commercial fisheries sector contributes ca. 0.5% of GDP, with earnings totalling R1 billion. South Africa’s 3 000km coastline and Exclusive Economic Zone service the country’s 21 commercial fisheries, which are managed by stringent set of scientifically-based regulations, but enforcement of legislation is limited. The key fish resources of South Africa’s coast include hake, pilchard, horse mackerel and anchovy. Some fish stocks, such as pelagic schooling fish (sardines and anchovies) and demersal species (Cape hake, Merluccius spp.) are considered to be well managed and in a healthy condition. However, many years of overexploitation and poor management have caused the abundance of many other species to drop to dangerously low levels. 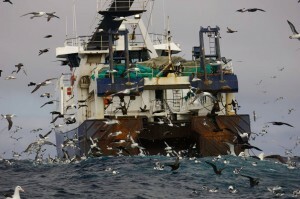 It is estimated that 76% of global commercial fish stocks are exploited at or beyond sustainable levels (FAO 2007). In SA, this is mostly due to overfishing and illegal, unreported and unregulated (IUU) activities, but also destructive fishing methods, lack of scientific monitoring of fish stocks and poor management (Barendse 2008). Sustainability in SA has been based on catch limits, controls on by-catch and protection of marine habitat from destructive fishing methods. However, success has been limited and economic incentives, in the form of well-designed ‘catch shares’ or ‘Limited Access Privilege Programmes’ (LAPPs) have not been used in SA. LAPPs have resulted in significantly decreased environmental damage and increased and economic returns globally (White 2009). In response to the major lack of awareness amongst South African consumers and retailers about which marine species are threatened, and the fact that many threatened species consistently appear on restaurant menus and in retail stores, WWF launched SASSI in 2004. SASSI is part of WWF’s Sustainable Fishieries Programme. SASSI improves consumer awareness of fish stocks through a wallet-sized pocket guide, which groups fish species into 3 colour-coded categories: Green (healthy, relatively well managed species); Orange (legal, but stocks are vulnerable or fishery impacts on the environment are severe) and Red (illegal to sell in South Africa). 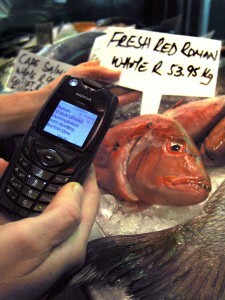 You can get these lists through wireless technology (supported by iVeri Payment Technology ‘Infoline’) called ‘FishMS’. You can text the name of any fish to 079 499 8795 on your mobile phone and receive an immediate response telling you whether to tuck in (Green), think twice (Orange) or avoid completely (Red). SASSI trains and monitors restaurants and retailers: 32 restaurants including Ocean Basket and John Dory’s chains are being trained in correct species identification, sustainable seafood policy, species lists, traceability, labelling and consumer/staff awareness. Three ut of five major retailers have committed to a Retail Charter and undergo 4-monthly performance assessments. Brand development and the WWF logo are offered as incentives. SASSI is now supported by numerous other partners, including Pick ‘n Pay, Iveri Payment Technology, the Department of Environmental Affairs and Tourism, Two Oceans Aquarium, Ezemvelo-KwaZulu Natal Wildlife, SAIAB, Sea World at UShaka, Traffic, Endangered Wildlife Trust, Sharklife and PGW-Eat.